“[Prom] is a big deal,” senior Analesse Bath said. Many Rose students put a lot of work into prom. Girls who attend have to not only get a dress, but get their nails, hair and makeup done, whether they do it themselves or leave it to the pros. Girls and guys both have to worry about flowers. It is a tradition for the boy to get the girl’s corsage, and the girl to get the boy’s boutonniere. Corsage and boutonniere come in many different colors and styles. Terri Swiderski, mother of Austin and Dustin Swiderski, sold both sets of flowers to Rose students. She had many different options for prom attendees to choose from. Swiderski had different style bracelets, some with beads and some without, along with different colored ribbon to match any girl's dress. Swiderski made all of the corsages and boutonnieres herself; she sat in the commons starting a week before prom and almost every day leading up to prom so students could order their flowers during SMART Block. “Me being out here makes it much more convenient for the kids,” Swiderski said. 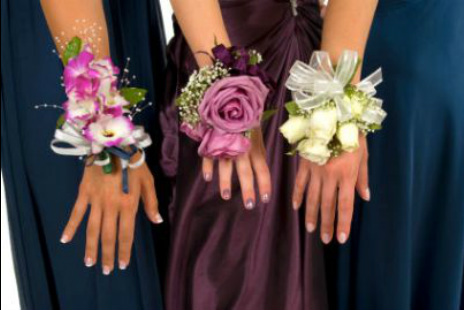 The corsages ended up costing about twenty two dollars and the boutonnieres ended up costing about nine; the price varied depending on what bracelet and ribbon color the student wanted. Flowers can be expensive but Swiderski offered a good deal to Rose students. “We are a lot more reasonable than your grocery store or florist,” Swiderski said. According to Bath, the quality of the corsages was just as good as the price. “All of my others have been from Jeffersons and the flowers have fallen off but this time mine stayed together really well,” Bath said. Some people were excited to find out that Swiderski was giving 10% of the proceeds to SGA at Rose. “I think it’s a good idea [for] fundraising,” Bath said. This was not a widely known fact; Bath believes that more publicity would have benefitted Swiderski’s business. “They should have advertised for it on the announcements or something because if they did, more people probably would of bought it from there,” Bath said. This is something that Swiderski plans to do in the future. Bath hopes that the knowledge of Swiderski’s 10% donation to SGA will spread so that her business, as well as SGA’s funding, will increase in the future. “We [haven’t sold] as many as we wish because it’s still a new idea and concept,” Swiderski said. Along with the high quality of the corsages, Bath liked that she could order and pick up her flowers from school. “It seemed funny ordering it from school but it was really nice that it was delivered here, and also I got a lot of compliments on it,” Bath said.